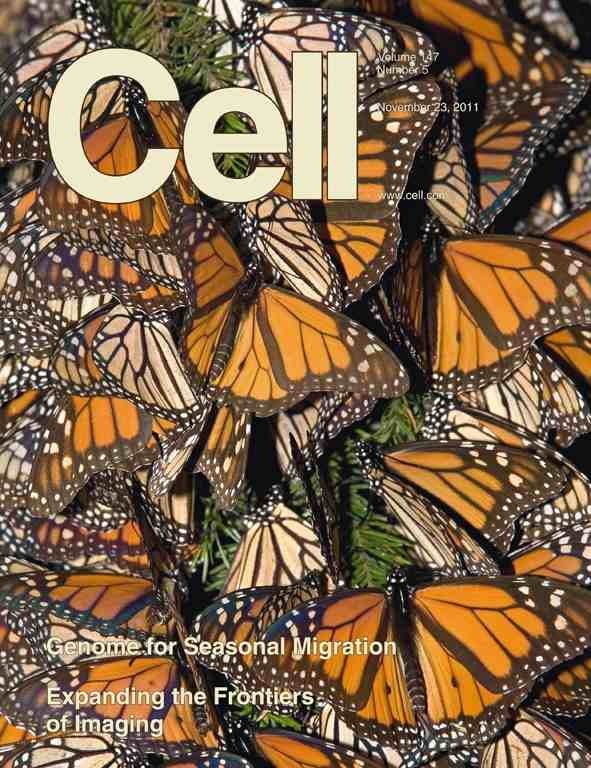 Our work (and that of our collaborators at the University of Massachusetts) on the complete genome sequencing of the monarch butterfly, Danaus plexippus, was published in the November, 2011, issue of the journal Cell. Shuai, Z., C. Merlin, J. L. Boore and S. M. Reppert, 2011 The monarch butterfly genome yields insights into long-distance migration. Cell 147: 1171-1185. Data and many interpretations from this project are available here. We present the draft 273 Mb genome of the migratory monarch butterfly (Danaus plexippus) and a set of 16,866 protein-coding genes. Orthology properties suggest that the Lepidoptera are the fastest evolving insect order yet examined. Compared to the silkmoth Bombyx mori, the monarch genome shares prominent similarity in orthology content, microsynteny, and protein family sizes. The monarch genome reveals a vertebrate-like opsin whose existence in insects is widespread; a full repertoire of molecular components for the monarch circadian clockwork; all members of the juvenile hormone biosynthetic pathway whose regulation shows unexpected sexual dimorphism; additional molecular signatures of oriented flight behavior; microRNAs that are differentially expressed between summer and migratory butterflies; monarch-specific expansions of chemoreceptors potentially important for long-distance migration; and a variant of the sodium/potassium pump that underlies a valuable chemical defense mechanism. The monarch genome enhances our ability to better understand the genetic and molecular basis of long-distance migration.